A brilliant new series from Holly Willoughby and her sister Kelly. Let these celebrity sisters show you the jet set. TV presenter Holly is lucky enough to be a real-life star. Now she’s mixed her experiences with memories of her schooldays to create this dreamy series about an elite stage school. 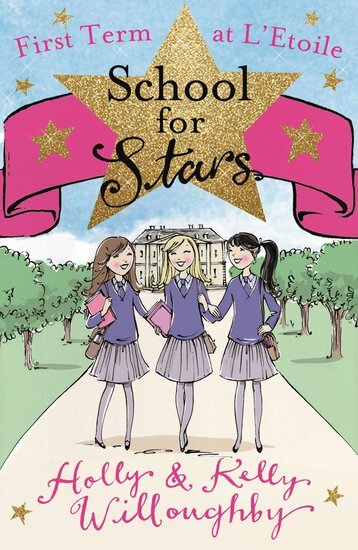 Meet twins Maria and Molly Fitzfoster as they start their new life at L’Etoile. Can they stand up to mean Lucifette Marciano, who wants to wreck their chances and claim fame for herself? It’s a good book but didn’t grab as much of my attention as many other books I’ve read! OMG!!!! Best Book Ever! Well actually I shouldn’t say that because the other ones in the series are probably great too! :) Great storyline, Great illustrations, all together a great book! I’d recommend this book to others!